Devil’s Hollow is a 78-acre conservation area tucked within Bell Acres Borough and adjacent to Sewickley Heights Borough Park. 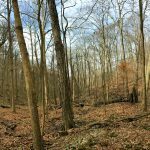 Steeply sloped and heavily wooded, the property is home to a major tributary of Little Sewickley Creek, large stands of American beech trees, and a rustic trail system that guides visitors from creek bed to ridge top. The property and trails are accessible from a small gravel lot located along Sevin Road where there is a small meadow. Devil’s Hollow was donated to ALT in 2016 by the Little Sewickley Creek Watershed Association. 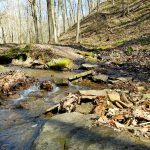 The 78-acre parcel is included in the Allegheny County Natural Heritage Inventory and was originally donated to the Watershed Association in 1994 by the Western Pennsylvania Conservancy. Some areas surrounding the conservation area are similarly underdeveloped, so visitors are asked to be sensitive of trails that lead into other landowners’ property. 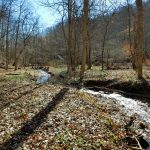 Conserving Devil’s Hollow provides benefits including enhancing water quality of the tributary to Little Sewickley Creek, protecting wildlife habitat, and providing recreation opportunities for visitors.